It's one thing to talk about the way a grown-up looks, but children should always be off-limits. Unfortunately, some online trolls spare no one when they dish out criticism towards celebrities. Over and over again, we've seen celebrity parents get subjected to unsolicited criticism about the way they choose to raise their children. After having a rough start to the year, including a nervous breakdown, actress Tori Spelling is once again forced to deal with more negativity, but this time it's coming from strangers on the internet. Like many parents have done over the last few days, the heiress and Beverly Hills, 90210 alum shared a photo of her children's first day of school with her Instagram followers, but instead of sweet well-wishes, her comment section was flooded with nasty comments about the way her kids, Liam, 11, Stella, 10, Hattie, 6, and Finn, 5, looked in the snap. "School officially began today for my 4 older kiddos...," Spelling wrote in the caption. "This marks the first year that they’ll all be in the same school at the same time. You know what that means? For one year and one year only ONLY 1 drop off= Happy Mom 💁🏼‍♀️And, Finn started Kindergarten at his new school and felt so proud to be at his big boy school with his older brother and sisters. " 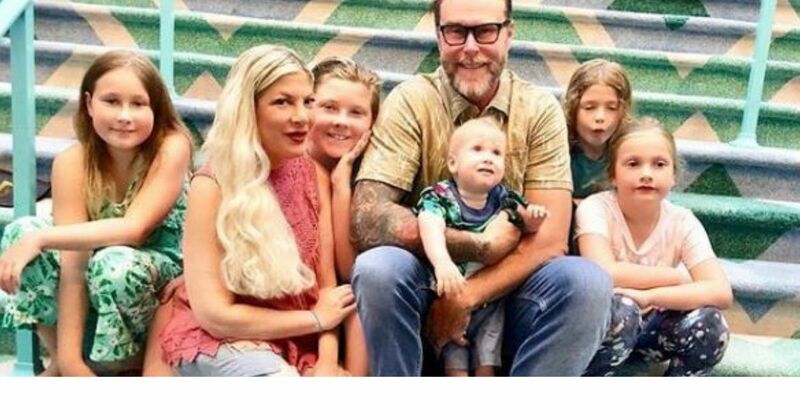 People were quick to mom-shame Spelling, with some calling her kids with Dean McDermott "raggedy," and saying that "all four need a makeover." Others called the actress out for letting her kids get "fat" and "unfit." "I'm sorry but you know Better....why would you let your kids out the house like that..... Didn't your mom ever teach you to look presentable in public.....SMH.....," wrote one critic. Another noted that although they're aware that everyone "will say it's rude, disgusting, etc," they still had to let Spelling know the proper way to feed her son. "Yes of course everyone will say it’s rude, disgusting etc. But the older boy is self conscious because he’s tugging at his tshirt. That’s sad. She needs to feed (them) [tons of protein since they are growing rapidly at that age and throw out the junk food in the house]"
Some people drew attention to the kids' clothes, saying that they look "old, the necks are completely over stretched, plus they're not ironed." "I'm all for Kids picking out their clothes, one they hit a certain age! First Grade & Kindergarten is a little young- this is just my opinion. What I see 'wrong' is the T-shirts look old, the necks are completely over stretched plus they're not ironed. And okay, if you want to look past that: at least do your Daughters hair! It doesn't take that long, and Finns hair could've maybe been put up in a "Mans Bun"? Again these are just my opinions: I'm not judging these littles at ALL- but I am judging Tori, she, like MANY have pointed out, does not leave the house unless she's "put together" even if she's wearing comfy clothes her hair is done. I see none of that in this picture. When I first seen the picture I thought they were going camping. One more thing, if you do want your Children to pick out their own clothes, do it the night before and give them options!! This way you know the outfit matches and if you need to iron it, you have the time." One user went as far as saying that Spelling is "an awful mother," and her husband is "as big a deadbeat as ever." There were many who came to Spelling's defense, saying that they didn't "see anything wrong with these beautiful children," but the bullying got so bad that the actress herself was forced to respond. "I am a proud mama bear and I enjoy sharing our family journey with my family, friends, fans, and online supportive and loyal community. And thank you to all the #mamabears out there. We always have each other’s backs! I was raised to believe that if you can’t say anything nice about someone then don’t say anything at all. The judgment here should be on your manners. Empowerment goes both ways. Lift others up and you in turn lift yourself up." Good for her for sticking up to the bullies, especially when they're being awful towards her children. To be honest, the kids looked fine, and the only thing shameful about this whole situation is the fact that grown-ups are hiding behind screens and talking smack about kids.